Best Days: Entire period: plenty of trade swell, biggest late Thurs/Fri, but also holding over the weekend. Generally good winds. Recap: We’ve seen steady E’ly swells for the last few days, with size up around 3ft+ across SE Qld and Far Northern NSW, smaller to the south. Winds have been mainly light and variable, occasionally moderate onshore at times acrss some coasts, though with no discernible pattern (the Mid North Coast has been under a moderate NE breeze). A long period S’ly groundswell glanced the Northern NSW coast today though it was very patchy in coverage, only favouring a handful of south swell magnets south of Byron (and many regularly reliable south facing beaches came in undersized). The reasons for this were details in the comments section in Monday’s FC Notes for the Sydney region, but ultimately, it’s not unexpected: Monday’s SE Qld / Far Northern NSW notes detailed that “these kinds of flukey long range south swells often don't light up every beach (even those facing south)”. In short, the reasoning is that it was a classic case of 'magic numbers' - where the particulars of this swell (period, direction) have been well aligned for some coasts' bathymetry, and poorly aligned for others. No major changes for the rest of the week with mainly light variable tending onshore winds winds expected across all coasts both days. With the south swell not really doing much now, and expected to ease into Thursday, our attention will remain focused to the east. And, we have an increase in store for later Thursday and Friday, courtesy TC Mona, which has been lingering near Fiji all week. Initially, Thursday morning will likely begin undersized, but at some point throughout the day we’re expecting a boost in swell periods and thus wave heights. And because of the position of the swell source, we should see a reasonably broad coverage of size (compared to systems in the lower Coral Sea), though surf size will still be biggest in the north. Surf size should increase back up to 3-5ft across Far Northern NSW and the SE Qld, with smaller surf running down the SE Qld points. Expect slightly smaller surf as you head south from about Yamba. The bigger set waves will be pretty inconsistent too. 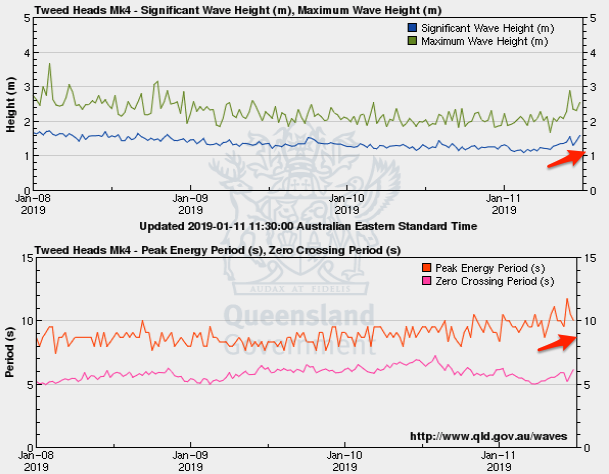 There’s no distinct trend expected in the size department, with the swell likely to pulse intermittently each day. So, with the light wind outlook it’ll be worth slotting into a quiet beachies session through the middle of the day if you can move your diary around. We’ve had a few changes to the weekend outlook since Monday’s notes were prepared, mainly around local winds. They’re still expected to be from the same direction, but will be much lighter across the Mid North Coast, whilst we’ll see freshening SE tending E/SE winds across SE Qld as a ridge pushes into the coast from the Coral Sea. Fortunately, there won’t be any shortage of swell. The remnants of TC Mona will drift westward, enhancing the trades and maintaining E’ly swells over the weekend that may hold a similar size to what’s expected later Thursday and Friday, though with a little less push and definition. Even with a slight deterioration of the wind outlook for SE Qld, we’ll still see pockets of light winds in the morning (mainly southern Gold Coast) and the points should offer plenty of good options. 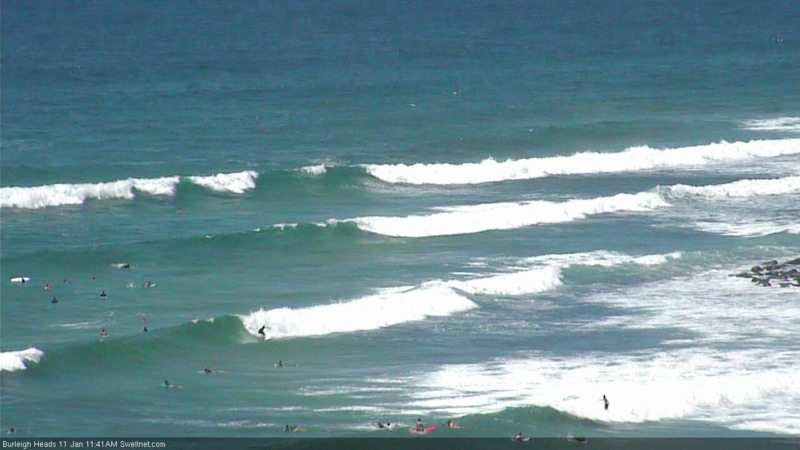 South from Ballina, we’ll see light variable winds and sea breezes both days. The models have eased back the lingering troughiness near Fiji, so we don’t have much new energy on the long term radar from this neck of the woods any more. There’ll be small persistent trade swell for much of the week though no major size is likely. The first half of next week will be dominated by freshening N/NE winds across the Mid North Coast, though it’ll remain much lighter north from Byron Bay. We may also see a small southerly swell across Northern NSW generated by a front passing south of Tasmania over the weekend. Nothing significant is expected though. This will then be followed by a small spread of long period S/SE groundswell across northern NSW mid-late week, originating from the merging of several Southern Ocean lows, that’ll momentarily stall on the eastern periphery of our southern swell window, on the approach to New Zealand. 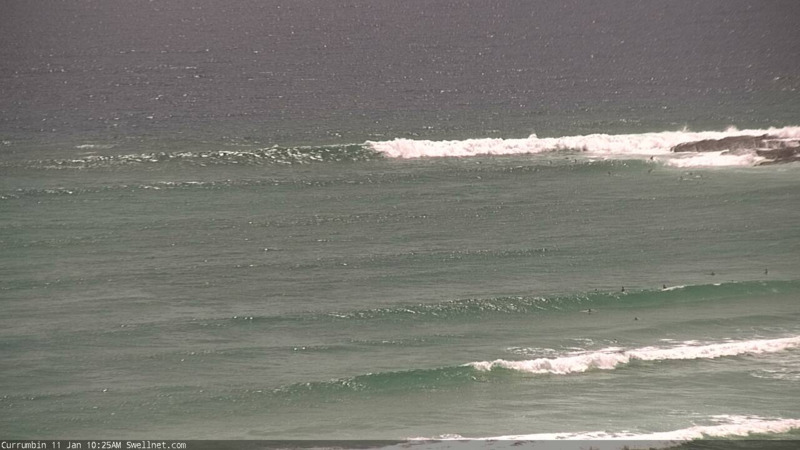 This won’t provide much size but south swell magnets south of Byron may pick up some stray 2-3ft sets Thursday or Friday. What's that....do I detect some winds coming with the letter "S" in them....fck off!!! 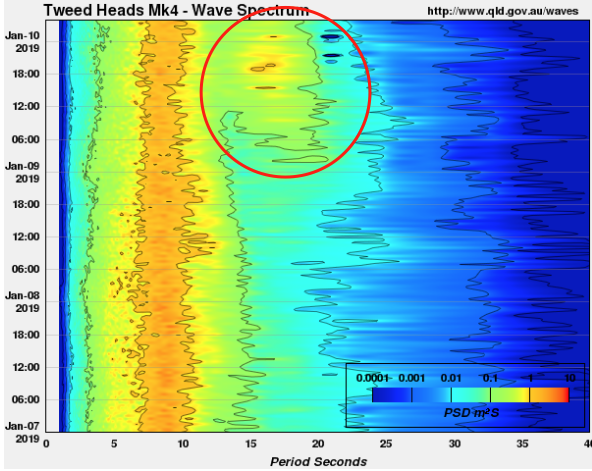 I love the spectral analysis from the Tweed buoy. Looking at the standard time series graph yesterday, and you'd have thought there'd been little to no change in the E'ly swell regime. 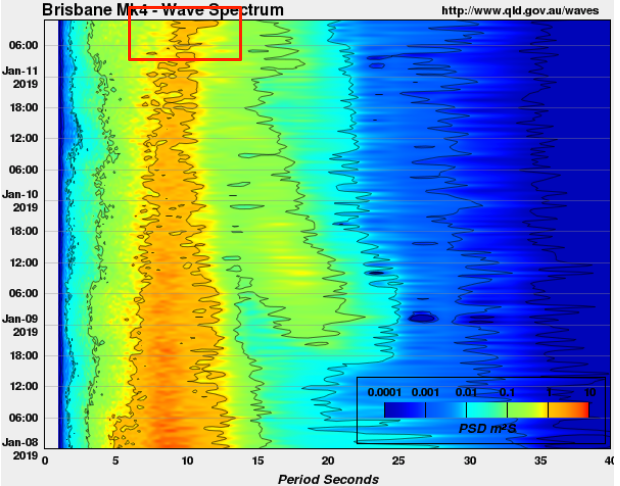 But.. a closer look at the wave spectrum shows that the leading edge of the long period S'ly swell reached the Tweed buoy early morning (albeit quite faint), peaking just after dinner time (the two dark patches just above the 18:00 mark, inside the circle). Whilst the trade swell maintained a broad spread within 7-11 periods, the S'ly groundswell was narrowly focused in the 15-17 second range. At the beach, such a small, inconsistent south swell signal would have been barely discernible beneath then existing trade swell source. 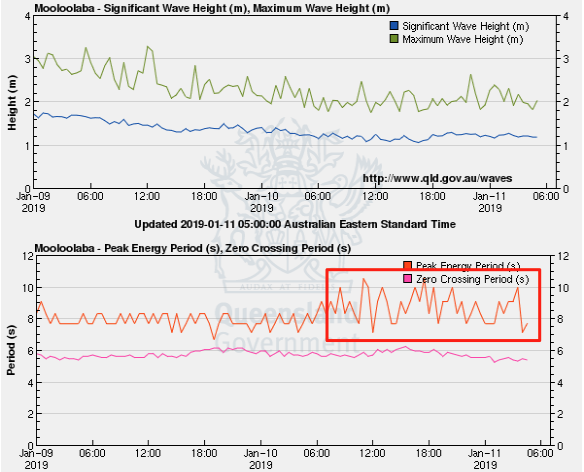 However, had this event occured during a period of inactivity, then it would have been very useful to assess for surfable options (the irony being that this particular swell would have ultimately arrived too late to provide decent options before the sun went down). In any case, the availability of this data helps to refine our forecast models and methods. 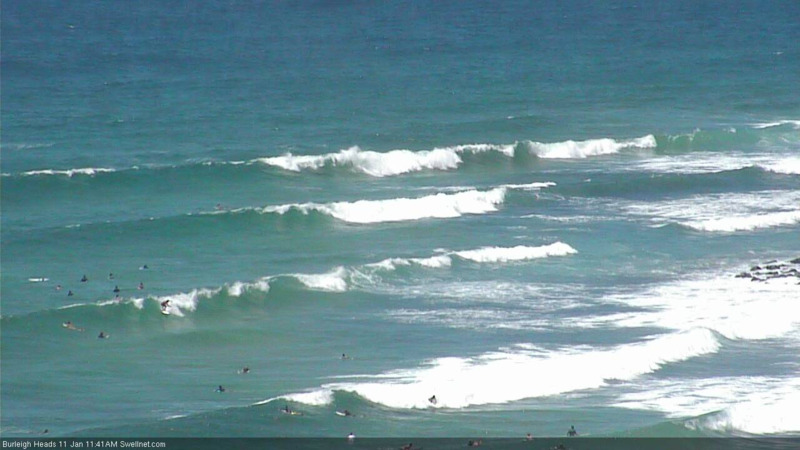 Just had a quick paddle, coupla sets started to lineup and felt stronger than the last few days, kinda like a new swell. Will have to wait and see if it amounts to anything though. I can't see any extra E swell where I am, but that sneaky little S pulse just before dark last night sure was fun. Fun beachies around lunch time, felt like the swell had a bit push. Checked a few spots on the way home, no more size than earlier but some big rips forming across the open beaches which usually happens with long period east swells. yeah, you could see the extra line in the swell on dark. 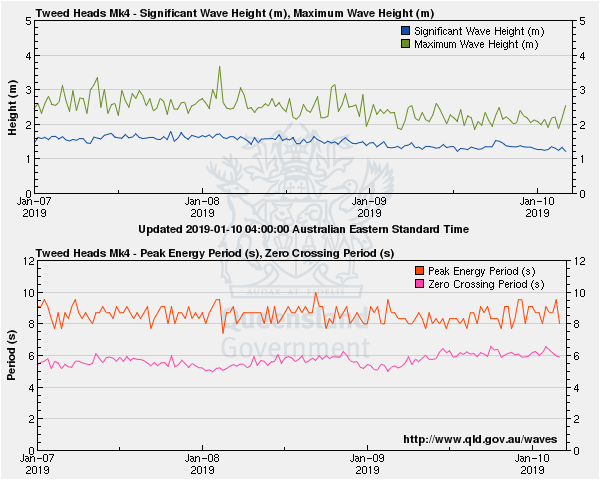 Hmm, a couple of buoys seem to pick up signs of the new swell yesterday (via a slight increase in Tp, see Mooloolaba below) but it's not showing everywhere, and there's certainly no sign of any more size at the coast yet. Still, it's early days - these poorly consolidated, long range tradeflow-embeded systems don't usually produce defined swell fronts so the eventual swell trend is often slow and erratic. So we need some elasticity in our expectations. no extra size here, but you could definitely discern a change in swell quality yesterday afternoon....the line was longer and more defined. 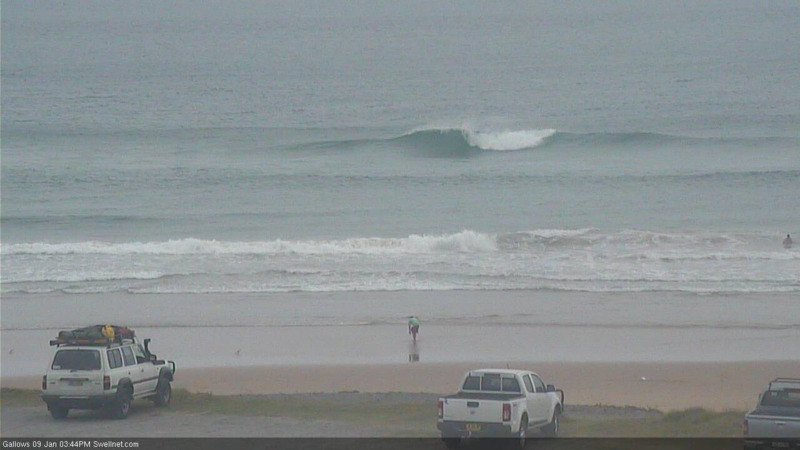 still, it was well under the threshold to fire up the local points and was just making the beach breaks close-out. Same onshore gurgle conditions this morning. I can 't see any major pattern change to the current formula of weak high pressure in the Tasman and established NE wind patterns. If anything, it looks more embedded in the medium/long range. For reference to this time last summer: we had a winter calibre low pressure in the Tasman and I rode a 7'6" at 8-10ft Lennox point. Ironically, our biggest S swell of the year. You ridden that board much fr76? fair bit.....always looking for an opportunity to ride it more though. Only rode it once last year and that was in January. Yeah, I like taking mine out every now and then even in the small stuff just to cruise along and break up surfing my short board all the time. Probably a better idea than I’ve been pursuing. That of going out in small stuff then feeling like breaking up my short board. Been watching the cams for the last 10-15 mins, and there's more definition in the lines now, and it seems to be edging up a little in size too. The frame below is the first set I've seen break like this off Currumbin all morning (we're right on high tide too, which has been part of the problem here for the last few hours). Nice screen grabs. Looking much better! 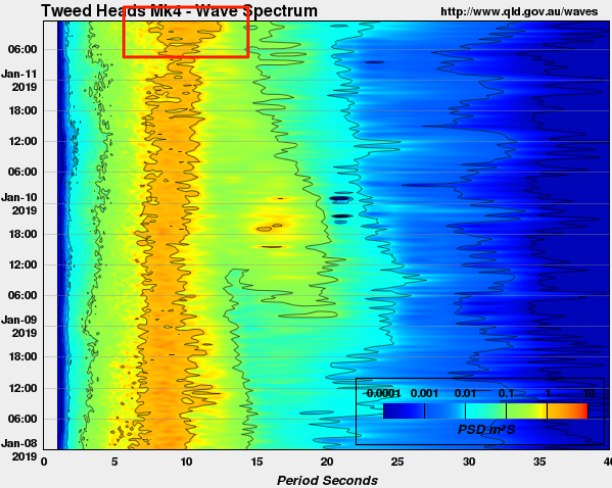 Definite kick showing on buoys now (spectral data showing the best).